Star Trek has long been defined by its uniforms. Since the very beginning, fans of the show have spent hours poring over and replicating the Starfleet uniforms of the show. 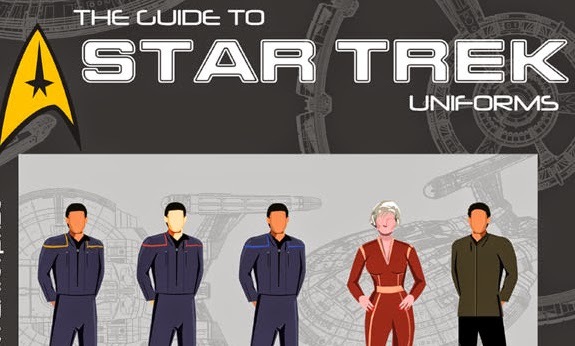 From the Original Series up to Enterprise, there are a wide variety of uniforms to choose from. But can you tell the difference? This handy infographic by Costume Supercenter is the perfect place to start. It's interesting that in the very first Star Trek pilot the women wore pants and then by the Kirk episodes they went with the miniskirt look. I bet that was some horny producer or studio exec's idea. That was dangerous to put everyone in the movies in red! It led directly to Spock's death! The next generation uniforms look a little like Deep Space Nines with those greys and blacks.